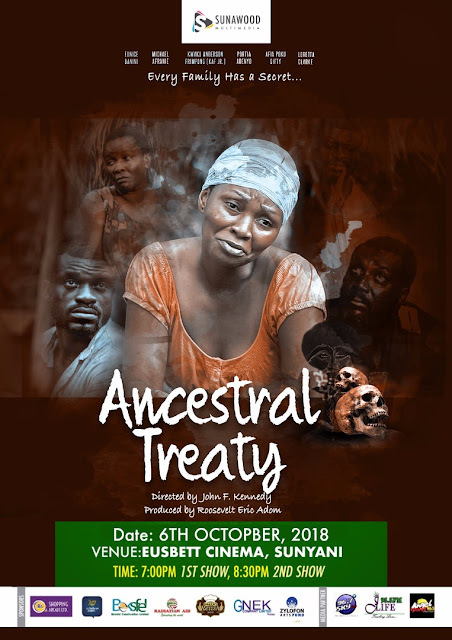 A Sunyani-based production house, Sunawood Multimedia, is gearing up to premiere its second movie titled ‘Ancestral Treaty’. The premiere will take place at the Eusbett Cinema in Sunyani on Saturday, October 6, 2018. First show of the movie will start at 7:00 PM—while the second show begins around 8:30 PM. The producer of ‘Ancestral Treaty’, Roosevelt Eric Adom said the movie talks about the need for girls to be in school. “Ancestral Treaty,” tells the story of what some members of certain families who refuse to serve in the shrine go through. It tells a typical African Fetish to believe in bringing a person to serve the gods. It’s a combination of reality and supernatural abilities of these gods. “Ancestral Treaty” can be horrifying but tells the true story of what a person has to go through to be a priestess in a shrine. “In the movie, Asantewa is forced to stop schooling and taken to a shrine to serve as the priestess which according to her father was her birthright. Several attempts to escape tradition didn’t work she gives up, she is finally digested into the shrine and accustomed to the livelihood of a Chief Priestess until her Calvary arrived in the person of her stepbrother; a strong believer who manages to whisk her away from the arms of evil,” he disclosed. The Michael Eshun written story was directed by John Frimpong Kennedy. ‘Ancestral Treaty’ was shot at Tanoboase in the Techiman North District of the Brong Ahafo Region. Cast: Kaf Junior, Eunice Banini, Michael Afrane, Loretta Clarke, Afia Poku Gifty and Portia Adenyo.